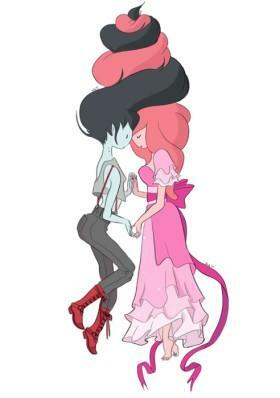 Bubbline. DON'T SHOOT ME! It is Adventure Time related so I পোষ্ট হয়েছে it. SO THERE!. Wallpaper and background images in the ফিন ও জ্যাকের সাথে অ্যাডভেঞ্চার টাইম club tagged: adventure time marceline princess bubblegum bubbline. DON'T SHOOT ME! It is Adventure Time related so I পোষ্ট হয়েছে it. SO THERE! Dammit, it's not ice cream! Nao, I bake my own bubblegum+black beans cookies. *sniffs* Mmm... Fresh from Ice King's fridge. OH MY GLOOB MY SISTER THINKS IT'S ICE CREAM 2! Oh my Glob, you bake?!?! I always do (once made snacks with a group @ school irl, but this time it's a classic Filipino snack). I bake cookies and pancakes. But usualy use microwave and toster not for cookies and pancakews though!